Lyle: Even though I'm making this lesson for beginning guitarists, remember that the bar chords can be very tough to play at first. I bet there are a few of you out there who can relate. MArk: major A = Mi ?!? Lyle: A = major/M/Maj/maj/Mj. The chord letter name all by itself - A, means major. dan2: What's with the circles? Lyle: Playback the TAB file so you see and hear it on the virtual neck. The circled notes are the natural notes up the neck. George: Got to strengthen my 4th finger...any tips? Lyle: Pushups, pinky pushups. I have an old tennis ball laying around the house and I use that in my left hand to squeeze gently with my little finger for exercise. Lyle: I find it comfortable to use my 4th finger instead of my 3rd finger to make these major bar chords like this. Once my hand moves higher up the neck, like around the 5th fret, I switch to my 3rd finger. Lyle: Practice playing all of these chords up and down the neck. Make each note ring clearly. This is hard for some beginners, remember, but at least you are learning this now. Also, think of this as a chord library for future reference. Lyle: Practicing those chords up and down the neck is a good exercise to strengthen your fretting hand. Mute the 6th string with the tip of your index finger. You are going to use those major chord shapes a lot over the years, get used to them! Lyle: The minor chords found there at the first 4 frets you'll be using in many songs. Bbm, Bm, Cm, and C#m are not found in any open position chords. This will be your best place to find them. Joel: Cm's used in country and some other stuff.. Willie Nelson uses incessantly. Lyle: Yes, depending on what key they like to sing in, you'll run into those chords a lot. Lyle: So much to memorize. Do the best you can at this early stage of your development. Joel: It looks easy on paper.. more difficult in practice. Lyle: Major chords have a strong and plain sound, minor chords have a softer sound, dominant chords have a bluesy sound. bluesguitarmp3: ...and the sevenths just rounds it out, thanx. Lyle: Each chord gets a strum on beat one of each measure. oiler_fan9: What's the dif between B7 and BM7? 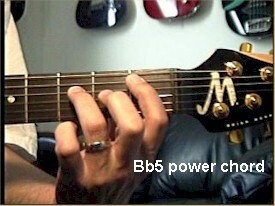 Lyle: The B7 chord has the "flatted 7th" in it, the BM7 has a major 7th in it. One fret difference between the two. bluesguitarmp3: How about a song teach, a song we all know? Lyle: Repeat that progression over and over. sammy_andrews: Lyle....will you tell me the fingerings for a couple of chords? Lyle: ok sammy, which ones? Lyle: sammy, look at this on the virtual fretboard. You'll see two notes that are 3rds. Lyle: Well, that's a m7 add 11, no 9 in it. Lyle: You're welcome. Here's a good time to take a break, see you at the next lesson!